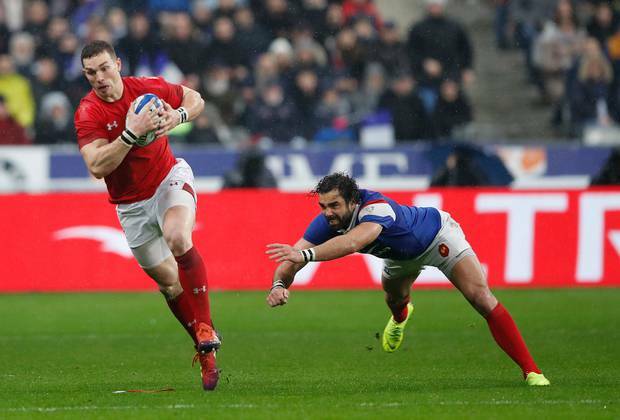 George North scored two gift tries as Wales rallied from 16-0 down to beat nervy France 24-19 in the Six Nations opener this morning. Two of Wales' three tries were donated by French mistakes, allowing Wales to pull off the biggest comeback win since 2000 when the tournament expanded. No. 8 Louis Picamoles scored an early try for France, and left winger Yoann Huget added a neat second midway through the first half after Wales fullback Liam Williams had one disallowed for a clumsy knock-on. France ended a miserable 2018 with a home loss to Fiji. So French fans could scarcely believe the 16-0 halftime score against the team second in last year's tournament and a strong candidate this year. Wales' George North makes an interception and gets away from France's Yoann Huget before scoring his side's third try. Photo / AP. Wales had to hit back strongly after the break, and did so when left winger Josh Adams cut inside and played scrumhalf Tomos Williams in near the 22. Williams jogged over unopposed down the right for a converted try, on his tournament debut. Then, French frailties crept back in as Huget slid to collect a kick and spilled the ball. North scooped it up on the line, and Huget held his head in his hands after an awful blunder under no pressure. Anxiety spread in the home crowd as Dan Biggar's coolly struck penalty put Wales one point ahead with less than 20 minutes left. Fear turned to relief when a mighty effort from the French scrum drew an error near the line, and Lopez clipped over the penalty for 19-17. But this French side has a worrying knack for making big mistakes. With the clock ticking down, North intercepted debutant Romain Ntamack's looping pass to Huget and sprinted home from 55 meters for a converted score. While Wales overcame a sloppy performance, France still seems chronically unable to make the most of a winning situation.